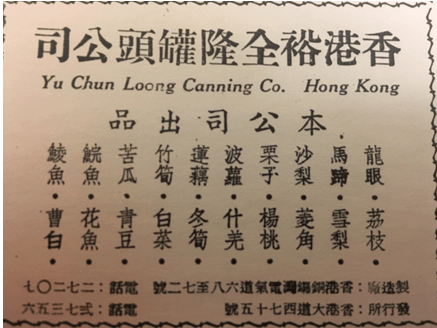 Founded in 1907, Yu Chun Loong Canning Co (also written as Yu Chun Loong Cannery) was one of the earliest, if not the oldest cannery in Hong Kong. Its founder T.Y. Sim (沈大欣) came from Chiuchow and operated a canning business in his native Swatow before moving to HK in the early 1900s. As one of the earliest Chiuchow merchants and industrialists in HK, he was involved in the founding of a number of Chiuchow resident associations. According to an industrial directory from the late 1940s, Yu Chun Loong had a 10,000 sq ft plant which occupied the space of five houses at 68-72 Electric Road in Causeway Bay while its distribution center was located at 75 Queen’s Road West in Kennedy Town. Its Lion brand of canned goods included a wide variety of food ranging from fruits such as longan, lychee, pears and pineapples to vegetables such as water chestnut, lotus, bitter melon, green beans and chestnut to fish such as grass carp (wan yu) and various Cantonese salted fish which were sold domestically and exported to the US and Southeast Asia. Business was strong during the War as supplies of fresh food was scarce. By the 1940s, the firm was managed by T.Y.’s third son James Sim Tze-young (沈梓揚) and fourth son George Sim Shiu-hing (沈瑞慶, 1916-2007), who were directors of the Tung Wah Group of Hospitals in the 1950s. By the 1960s however, Yu Chun Loong appeared to have gone out of business and the brothers operated import export firms Sim Brothers & Co and George Sim & Co (there was a George Sim Manufacturing which was a Swatow lace firm that was founded by a different George Sim) out of Man Yee Building in Central. According to their nephew Paul, the brothers were more interested in activities outside of business – James in betting on horses and George (who helped St Joseph’s College secured basketball championship when he was a student there in the 1930s) was a prominent figure in the athletic circle, having served as chairman of three leading athletic associations – South China, Kit Chee and Tung Wah (spinoff from the hospitals) and co-founded the Chinese Amateur Athletic Federation of HK and HK Olympic Committee. In the 1950s and 60s, George led the HK and Taiwanese football teams in many international and regional matches and when the team needed funding to go to the 1960 Rome Olympics, he helped to foot the bill. Another notable member of the family is Paul Sam (沈培文), the son of James and George’s fourth brother, who worked in advertising before starting Antique Cars (老爺車), the first men’s magazine in HK in 1967 which in addition to racy pictures featured articles by many famous novelists and landed exclusive interviews with the martial arts star Bruce Lee, who was a fan of the publication. In recent years, Paul (fondly referred to as “Uncle Paul”) operated the 50s bar and restaurant in the Lan Kwai Fong and worked as an interior designer in Macau. This article was first posted on 12th January 2018.